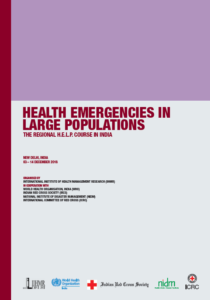 The third Regional Health Emergencies in Large Populations (H.E.L.P.) course is being launched by the International Institute of Health Management Research (IIHMR) in cooperation with the World Health Organization (WHO), the Indian Red Cross Society (IRCS), the National Institute of Disaster Management (NIDM) and the International Committee of the Red Cross (ICRC). The course will be held in New Delhi 3 – 14 December 2018. The H.E.L.P. course aims to equip professionals working in varied sectors to enhance their skills in response during health emergencies in large populations due to natural disasters, complex crises or disease outbreaks, with a focus on decision-making in crises. The course puts emphasis on affected people, in their context and uses a public health approach, fostering multidisciplinary responses and bringing out challenges, dilemmas, norms, standards and principles. It adopts participatory teaching based on concrete situations and decision-taking, group work in problem solving, simulations of disasters and presentations by the participants. It is a two-week on-site training on the principles and practices of humanitarian interventions in response to the needs of the people affected by acute and protracted crises and natural disasters. The course was created in 1986 by the ICRC in partnership with WHO and the University of Geneva, to professionalise the provision of humanitarian assistance during emergencies. Since its inception in 1986, about 4,000 professionals have been trained under this course. Participants are selected according to their professional experience and background. The last date for applications is 22 November 2018. I had already applied and submitted the detailed application form along with other documents required to the #IndianRedCrossSociety NHQ . I am very much intrested to complete this 2 weeks #HELP Course. Can you please follow-up on your application with Ms Bassi. I’m interested to join this course. Is there any fees to be paid. I want to apply for this course but did not get the link to proceed. please suggest me the proper way. Thank you so much. The course is for professionals with a health background such as medicine, nursing, public health and nutrition, for engineers in water and sanitation, or with strategic or management responsibilities in humanitarian emergencies. Participants have work experience in humanitarian emergencies (1-3 years), and have had will have responsibilities in managing operations or programmes.